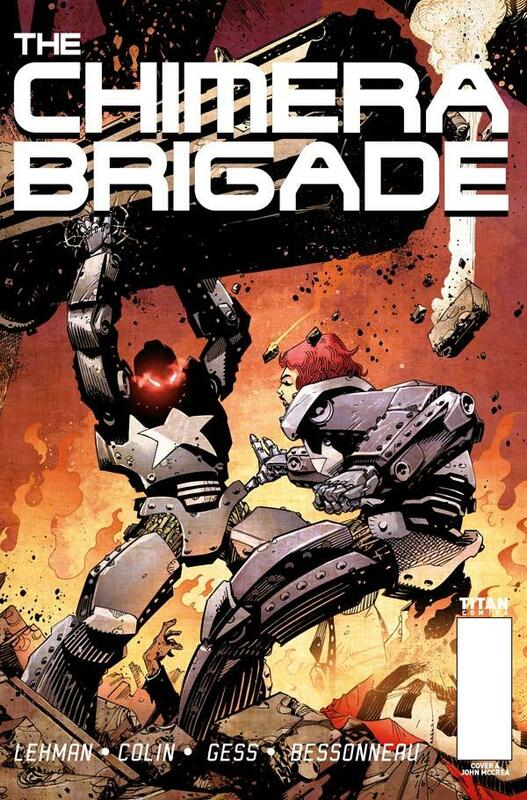 The Fellowship was fortunate enough to obtain a copy of THE CHIMERA BRIGADE #1 from Titan Comics. Serge Lehman and Fabrice Colin write, Gess draws, Celine Bessonneau colors, and Edward Gauvin translates. It all started in the Great War, where chemical weapons created the first superhumans. The famous Madame Curie was in the forefront of studying them, and twenty years later her daughter Irene is following in her footsteps. The rise of Nazi Germany is a pile of tinder, and Irene has discovered a secret meeting in the heart of that pile that may prove to be the spark of global war. The meeting has been called by a German super with well-known elitist beliefs, and all of the world’s known supers are in attendance (as well as a few unknowns). Irene has crashed the party with the help of a Russian super-suit. This is a kind of scary alternate history concept, the idea of a super-powered World War 2. How “alternate” it gets will be interesting to see. And the art is very nice, with enough gothic-retro style to generate a certain darkness of tone. Europe is in trouble, but can the supers of the world work together to stop a seemingly inevitable war? Pick up this book and let’s find out. THE CHIMERA BRIGADE #1 is available now at your FLCS or at titan-comics.com.